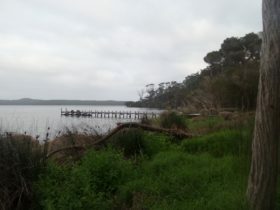 Cape Howe Cottages, midway between Albany and Denmark, provide a distinctly different holiday experience in secluded retreats nestled amid 53 acres of private nature reserve and adjacent bush and pastureland properties, so you can freely explore the peaceful surroundings and observe the natural world up close. 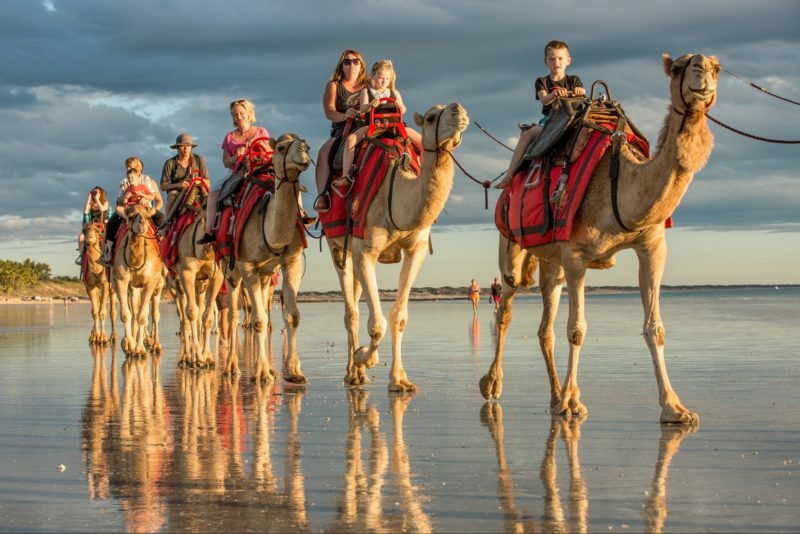 Adjacent to West Cape Howe National Park, one and a half kilometres from Lowlands Beach and the Bibbulmun Track – it’s the perfect location to explore the region all year around. The cottages are spaced well apart and are luxurious, beautifully decorated with quality furnishings and incredible attention to detail. You can choose an experience to suit you perfectly – whether a luxury retreat just for two, a secret escape to share with friends, a family hideaway or a cosy getaway where pets are welcome – total privacy is guaranteed. If you don’t fancy venturing too far, there’s a range of room service dining options available delivered hot to your door, breakfast baskets and packed lunches too. With so much to explore right on the doorstep, this is definitely a place to throw away the car keys and experience the pure beauty of the south coast in a very private retreat. 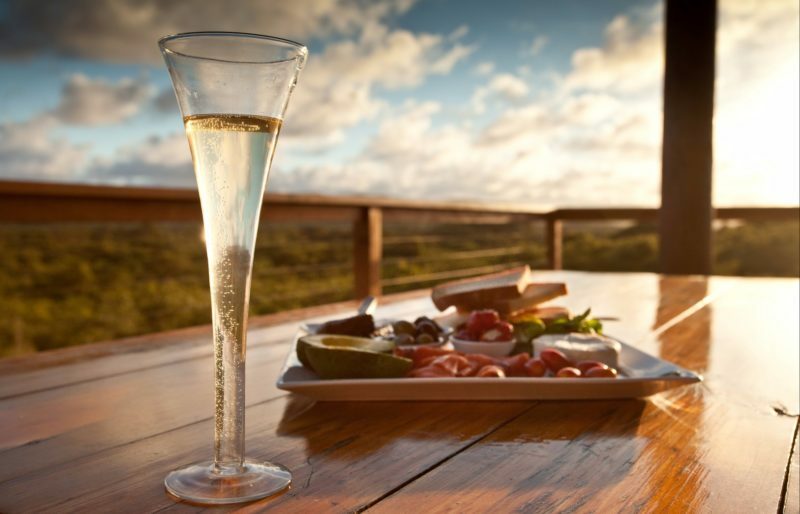 Cakes and Ale Cottage is a home away from home for sharing with friends or family and is perched high with views over tree tops towards the coastal reserve. 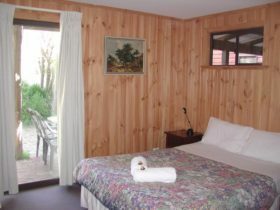 It is a large 2 bedroom cottage (102 square metres), well-equipped with deluxe furnishings and polished timber floors. There is a king size bed in one bedroom and two king singles in the other which can be configured into another king bed to suit two couples making an economical weekend escape. It has a open plan kitchen and a large bright living space leading to a deck where you can enjoy a barbecue with the birds or do some serious star gazing. 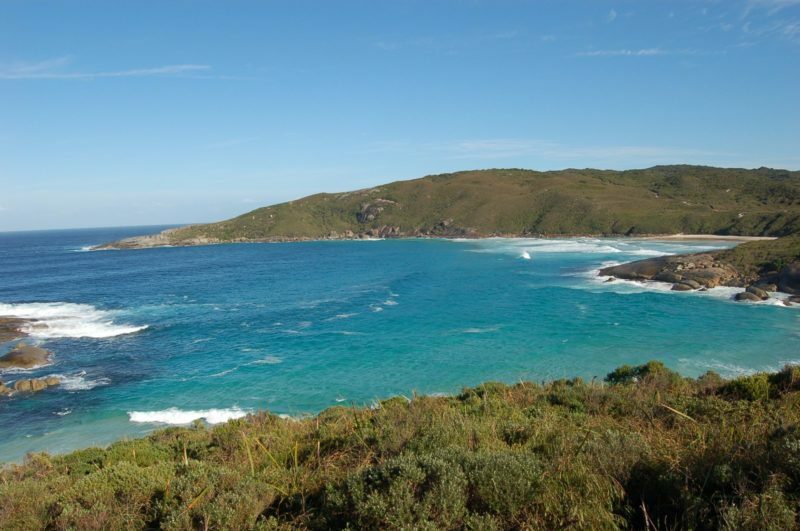 The Wardroom is built on a hill with views of West Cape Howe National Park, coastal reserves and the southern ocean. Its’ a very spacious, private luxury escape for adults or families. There is 2 bedrooms with a king bed in one and tw join-able king singles in the other. The bathroom has a rain shower and spa, a kitchen that would be a chef’s delight, lounge with quality furnishings, timber floors, convenient reverse cycle air conditioning for heating and cooling, sun decks with barbecue and many fabulous features to enjoy in complete privacy. Star Rating 4.5 stars. Kings Den is a huge luxury retreat just for adults and is 85 square meters. There is an opulent king bed on a timber platform, two person spa bath, outdoor shower in a private courtyard (and an indoor shower too), lounge/dining area and stunning kitchen to tempt the inner master chef. 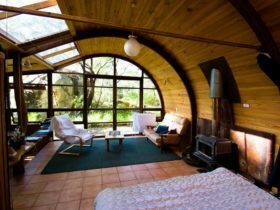 Kings Den is nestled amongst tall karri trees, totally private with great ambiance and something very special. Star Rating 4.5 stars. Keepers Lodge is a large 170 square metres mud brick holiday house on a separate 100 acre property close by with a couple of flexible set up options. 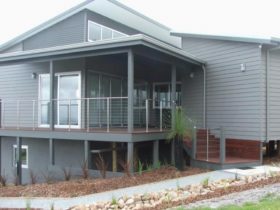 The house sleeps 10 people, is has four bedrooms and two bathrooms. Two rooms have queen beds, one room has two single beds, one room has a queen bed and a large bedroom has two single beds. To maintain lower tariffs for smaller numbers of guests occupying this large cottage, there are a couple of flexible set up options limiting the number of bedrooms and bathrooms available so you only pay for what you need. There’s plenty of space to spread out with spacious lounge, kitchen and dining areas. Enjoy a barbecue on the patio with stunning views across the valley to Denmark. Feed the free range friendly horses and inquisitive llamas on the adjoining farm. Star Rating 4 Stars. The Snug oozes old world, cosy charm reminiscent of your Grandmother’s house. It is roomy 80 square meters with 2 bedrooms, fully equipped with quality furnishings and polished timber floors. 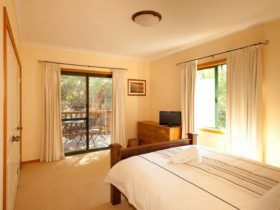 There is a queen bed in one bedroom and two singles in the other, a country style kitchen with jarrah table and an old fashioned kitchenette dresser. The veranda is perfect for watching the sun set or enjoying a barbecue. The Snug is set within its own 1/2 acre of gardens and lawn surrounding the cottage – great for kicking a football or a spot of cricket and is fully fenced for children’s safety and to keep the kangaroos from eating the garden plants! Star Rating 4 Stars. Salt Box is a funky and luxurious executive bushland getaway. 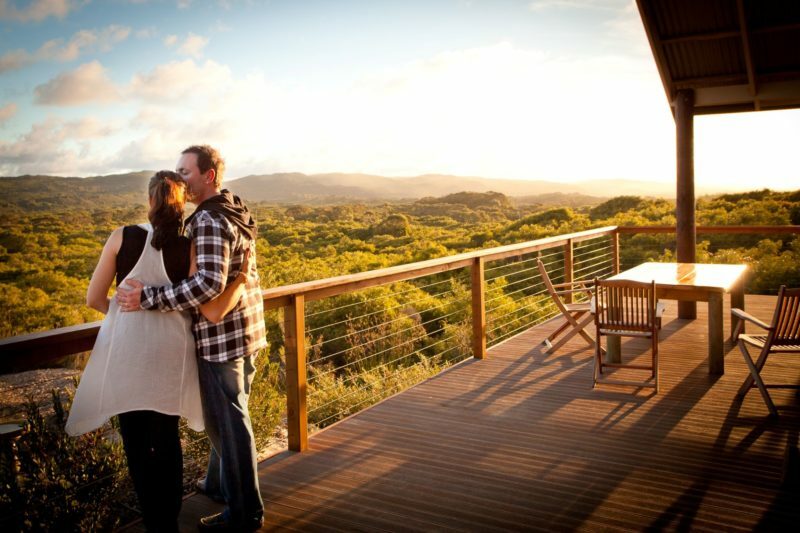 Enjoy the big skies with sweeping views of the coastal hills and treetops. This large 146 square meter cottage has a stylish king bed master suite with a spa en suite bathroom. The two other bedrooms can be configured as four king singles or two king beds and they share a large, bright and airy central bathroom. There’s a well appointed kitchen that the budding chef will love to create in. A spacious lounge/dining area leads to an outdoor barbecue deck – great to relax on those summer evenings. To maintain lower tariffs for smaller numbers of guests occupying this large cottage, there are a couple of flexible set up options limiting the number of bedrooms and bathrooms available so you only pay for what you need. Star Rating 4.5 Stars. 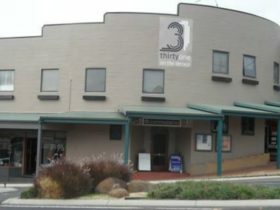 Extra person rate from AUD25 to AUD35 per night.